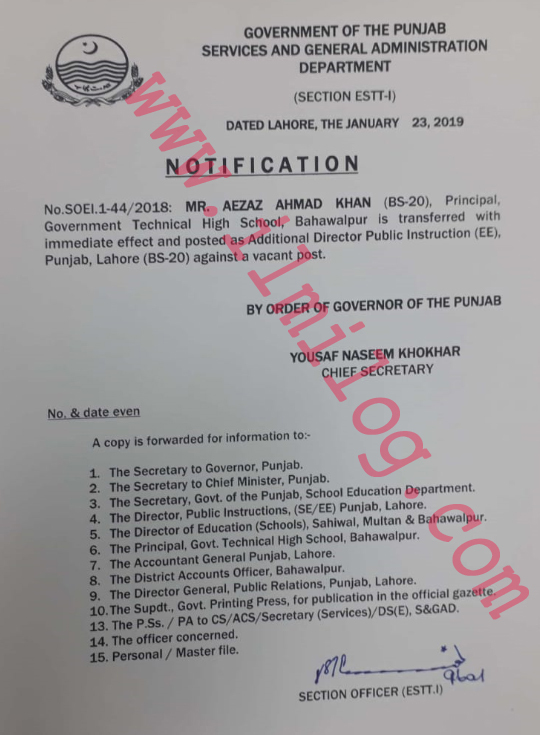 NOTIFICATION No.SOE1.1-44/2018 dated LAHORE, January 23, 2019, regarding Transfer posting Against a Vacant Post by a government of the Punjab services and general administration department. MR. AZIZ AHMAD KHAN (BS-20). Principal. Government Technical High School, Bahawalpur is transferred with immediate effect and posted as Additional Director of Public Instruction (EE), Punjab, and Lahore (BS-20) against a vacant post. 1. The Secretary to Governor. Punjab. 2. The Secretary to Chief Minister, Punjab. 3. The Secretary, Govt. of the Punjab, School Education Department. 4. The Director, Public Instructions, (SE/EE) Punjab. Lahore. 5. 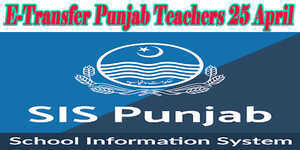 The Director of Education (Schools), Sahiwal, Multan & Bahawalpur. 6. The Principal, Govt. Technical High School, Bahawalpur. 7. The Accountant General Punjab, Lahore. 8. The District Accounts Officer. Bahawalpur. 9. The Director-General. Public Relations, Punjab. Lahore. 10. The Spud. Govt. Printing Press, for publication in the official gazette 13. The P.Ss. / PA to CS/ACS/Secretary (Services)/DS (E), S&GAD. 14. The officer concerned. 15. Personal / Master file.